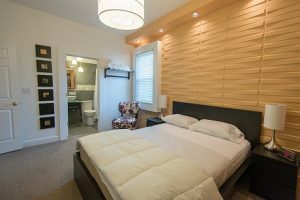 An executive apartment in Cincinnati is a short-term apartment rental, available on a month to month basis, that is fully furnished with linens, basic utilities, appliances, and more. Temporary housing rentals, such as executive apartments, allow executives a place to call home and relax while working in a different city during the week or for extended periods of time. An executive rental takes care of all the details for an employee while in a different city so the employee can spend time working and relaxing in their surroundings. Renting an executive apartment in Cincinnati provides an array of benefits. Companies who utilize executive apartments save money as compared to luxurious, expensive hotel stays which charge higher rates for extended stays. Furnished executive apartment rates are set at a 30 day minimum and have zero additional lodging taxes, often times saving companies up to twenty percent. Rates can also be broken down into daily rates for easy comparison to hotel stays. When employees stay in executive apartments they can enjoy full privacy. There is no reception to bother with or scheduling of arrival and departure. They are free to come and go as they please with a set of their own, personal keys. As opposed to a hotel room, an executive apartment provides a much more spacious layout. Executive apartments are available in one, two, or three bedroom apartments depending on your needs. There are also options available with HomeLinkCincinnati’s executive apartments to transform additional bedrooms into office spaces, if preferred. Additionally, executive apartments include full size kitchens giving a more homely feel and the ability to cook meals during employees extended stays. On average executive apartments are 800-1200 square feet. Executive apartments come with amenities to make for a more pleasant stay including utilities, high speed internet, parking, washer and dryer, expanded cable, and more. With the privacy and amenities offered, HomeLinkCincinnati’s executive apartments have to offer, employees can enjoy a better sense of home. Employees feel like they are living in their own surroundings rather than a rented space. Employees will feel more settled in an executive apartment than a rented hotel room. In addition, HomeLinkCincinnati will work with employees on furniture pieces and requests needed in executive apartments to suite individual needs. Employees can come and go as they please in an executive apartment rental. HomeLinkCincinnati’s executive apartments are conveniently located in the Cincinnati metro area for easy access to more popular areas of town. Areas Downtown Cincinnati and parts of Northern Kentucky, through Hyde Park, Oakley, Norwood, Kenwood, Montgomery, Blue Ash, Deer Park, and as far North as West Chester and Mason. If your business is looking for an executive apartment in Cincinnati, Ohio, contact HomeLinkCincinnati. Since 2008, HomeLinkCincinnati has been providing housing solutions for executives traveling or relocating to the Cincinnati area for work purposes. Our experienced staff will provide you with furnished apartment options to make your extended stay in our city as comfortable as possible. HomeLinkCincinnati corporate housing solutions are a great option for businesses relocating employees or needing to house employees for work purposes of 30 days or more in the Cincinnati area. 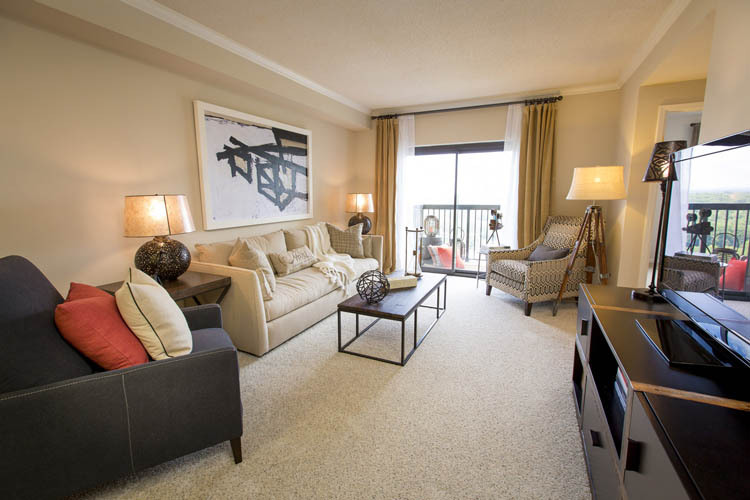 At HomeLinkCincinnati we offer businesses a variety of corporate housing options including corporate apartments, fully furnished condominiums, furnished residential apartments, furnished studio apartments, or bed and breakfast type guest rooms. All designed with the purpose of accommodating individuals or groups while traveling on business or needing an extended stay solution. Each corporate housing option is available for rent of 30 days or longer and keep employees happy with the comforts of home while being cost-effective for business owners. When employees arrive at their HomeLinkCincinnati furnished apartment, everything will be ready for them. Furniture, cookware, linens, electronics, TV, internet, and utilities made readily available. All of these amenities are included in an all-inclusive rate as opposed to separate utility, cable, or internet payments being billed to the company at the end of an employee’s stay. Corporate housing is not only beneficial to business expenses, but also the overall efficiency of traveling employees. Employees who are continuously traveling for their job often times feel stressed and uneasy during their extended stays in hotels. Corporate housing solutions give employees a more comfortable living environment while on the road making them more efficient at their job. With HomeLinkCincinnati’s corporate 30 day flexible leases, businesses don’t have to commit to 12 month terms for relocating or extended stay needs. This gives companies all the benefits of corporate housing without incurring the major costs of leasing or owning properties themselves. Businesses can simply lease furnished apartments on a needed basis. If a work project needs to be extended and employees need to still be present, simply extend the lease of the furnished apartment. If your business has work in the Cincinnati area you’ll want conveniently located apartments for employee’s extended stays in corporate housing. With HomeLinkCincinnati’s furnished apartments throughout the metro area, employees can conveniently be within minutes of their working destination. This is not only convenient to employees making their work commutes quicker, but will also save money for companies on car expenses. If you are looking for corporate housing in Cincinnati, contact HomeLinkCincinnati today. Our staff will review with you properties available for your needs and competitive rates to base your decision off of. If corporate housing is a foreign term to you, this may come as a surprise just how popular this option for temporary living has become. Corporate housing, or “furnished apartments” are used by all major companies when relocating employees to a new city. Unlike trying to live out of a hotel, corporate housing actually is located in a house or apartment which gives the tenant a better sense of home. The space alone is likely three to four times more than a conventional hotel and even twice as large as a typical extended stay hotel. Because corporate housing options come fully furnished, they may often be referred to as “extended stay apartments” or “serviced apartments.” Much like a hotel, once you have your reservation, you are able to arrive with just your luggage and enjoy life in your home away from home. This is where a corporate rental shines and feels more like a home, making your transition to a new city much smoother. What’s Included in Your Corporate Housing? Your furnished rental will include all your utilities and high speed internet. Better quality corporate housing companies will provide business class speeds (almost all of HomeLinkCincinnati’s are 100 Mbps+). Unites include new modern furniture, a full sized fully equipped kitchen, dining area,a washer and dryer, and high quality bed linens. HomeLinkCincinnati provides brand new, high quality bed linens for every guest, every time. Unlike in a hotel, tenants have two or three large flat-screen TVs with expanded cable. Most of our units have 50-65″ and over 300 channels. Parking is also included and many units have garages. Where is Corporate Housing in Cincinnati located ? One of the best advantages of furnished housing units, are that they are located in residential areas. All HomeLinkCincinnati units are close in proximity to restaurants, shopping, entertainment and business centers. Our corporate housing units are located between Downtown Cincinnati and Mason, Ohio and concentrated along the I-71 corridor. Many individuals are discovering what businesses have known for some time. Using furnished corporate apartments for a family’s temporary housing, makes for a much more pleasant experience. It also creates a true win/win all around. If you are in need of a corporate housing solution, contact HomeLinkCincinnati today.